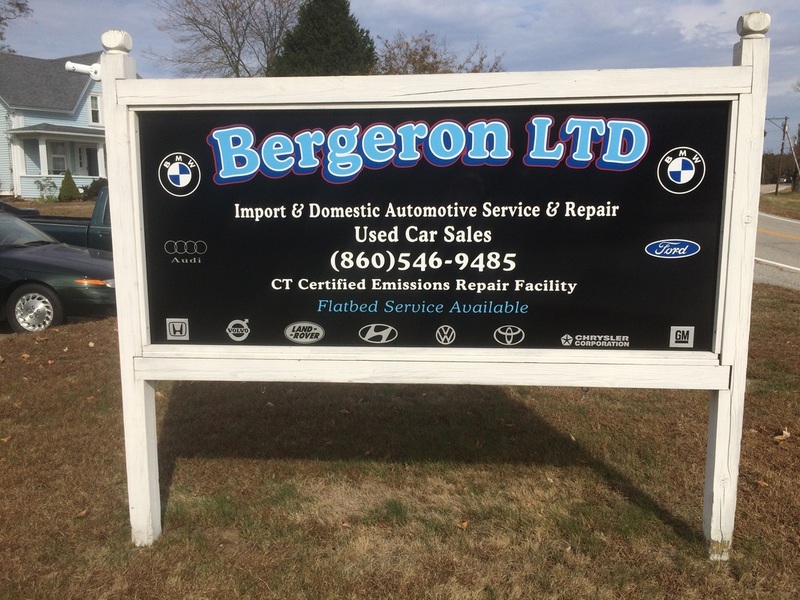 ​Bergeron LLC., located in Canterbury, Connecticut began in 1990 with one automotive technician, and we specialized in the repair and maintenance of BMW automobiles. We employ a full staff of qualified mechanics as well as a Service Advisor. We use Dealer Level Autologic (Registered) Diagnostic Equipment for BMW automobiles and other European Cars. While BMW products continue to be our primary specialty - with the extensive domestic and foreign auto repair background and experience of our staff - we pride ourselves in offering full service car and truck maintenance and repair for all makes and models of vehicles: Primarily Mercedes Benz, and including Volkswagen, Audi, Volvo, Nissan, Toyota, and Honda. From routine maintenance procedures to major engine component replacement, we do it all! With the significant growth of our auto business over the years, we now offer sales of pre-owned cars. Our standard for quality is high, so you can rest assured, a used car or truck offered for sale at Bergeron's garage in Canterbury, CT will be thoroughly inspected and in top-notch working order. See our current inventory of high quality pre-owned vehicles on our Facebook page. Bergeron Ltd. can tow your car or truck with our flatbed towing service throughout eastern Connecticut, including the towns of Lisbon, Plainfield, Norwich, Bozrah, Danielson, Brooklyn, Scotland, Killingly, Sterling, Moosup, Chaplin, Windham, Willimantic, Mansfield, Waterford, Pomfret, Thompson, Jewett City, Hampton, Lebanon, Colchester, Preston, Sprague, Griswold, and New London CT. Bergeron Ltd. offers honest and reliable automotive repair services by ASE certified mechanics and service technicians for vehicle owners needing Auto Repairs in Putnam CT or Norwich, CT or Willimantic, CT. Canterbury, CT is a small town in the country, but we're centrally located, and you won't find quality service like this at any dealership -- and you won't have to pay dealership prices!